If you recognize this picture, that's because I used it in my story of last years race. You can read it here. I really enjoyed the race and I'm happy it fit my schedule again this year. I just wish it wasn't such a long drive! The race is held in a very remote, rural and beautiful area of West Virginia.There are a lot of horse farms in the area. 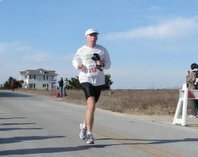 In fact the previous race director, Lynn Goleman was a horse rider and not a runner. She and some others in the area decided that sharing their trails would bring some needed dollars to the area. One thing that is different from most other races is that it is held on mostly private property. There are some short road sections but mostly the trails and paths belong to local property owners. They have opened up the gates to their pastures , fields and wooded trails to allow the race. The community is very supportive as the race is a major fundraiser for the local fire and rescue and Ruritan Club where the race is headquartered. With camping in the grassy field at the Ruritan Club there is plenty of chance for pre and post race socializing. They sell a good breakfast in the morning for a bargain price and then a chicken dinner is included afterwards. I hope to get some good pictures this weekend and improve on my time from last year. I promise I won't forget a water bottle this time! You should definetly try and get to this race sometime. Here is a link to the website. Thanks for Capon link. 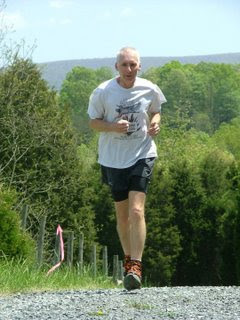 Are you going to do the Highlands 40 miler in West Virginia next month? No, that is only a week before Western States. I will be volunteering at the Boogie. I have heard nothing but good things about Highland Sky though. Maybe someday. Great to see you at Capon Valley. Great blog! Keep it up. Thanks Bill. It was good to talk to you Friday night. Getting to know people better is one of the best parts of our sport.